This chapter contains instructions for using the Logdump utility of Oracle GoldenGate. Logdump enables you to search for, filter, view, and save data that is stored in a trail or extract file. To avoid any adverse effects on the data or checkpoints in your trails, use Logdump only with guidance from an Oracle support analyst or an experienced Oracle GoldenGate user. Section 1.1, "Getting Started with Logdump"
Section 1.2, "Viewing the First Record"
Section 1.3, "Executing Basic Logdump Tasks"
Section 1.4, "Evaluating Transaction Size"
Section 1.5, "Maintaining Command History"
Section 1.6, "Viewing Logdump Command Information and Syntax"
This section introduces you to basic Logdump commands that enable you to open files, control the display, navigate through a file, and filter for specific information, among other basic tasks. It also illustrates and explains the components of a record. The steps in this section explain how to set up the Logdump environment and start viewing records. Run the logdump program from the Oracle GoldenGate installation location. Logdump command lines are numbered so that you can use edit and history commands. 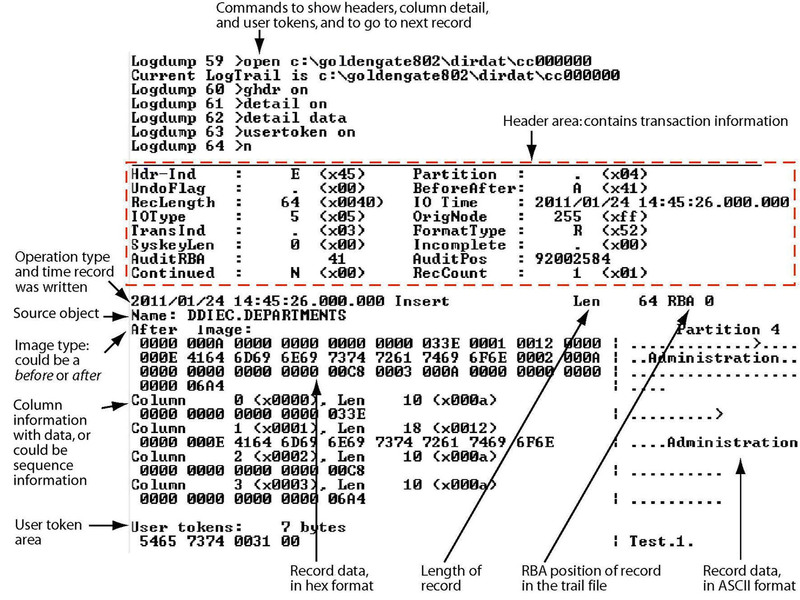 The following commands set up a Logdump environment that shows the information most commonly used when analyzing Oracle GoldenGate trail records. The record header contains information about the transaction. Column information includes the number and length in hex and ASCII. User tokens are custom user-defined information that is specified in a TABLE or FILE mapping statement and stored in the trail file for specific purposes. Oracle GoldenGate automatically generated tokes include the transaction ID (XID), the row id for DML operations, the fetching status (if applicable), and tag value. 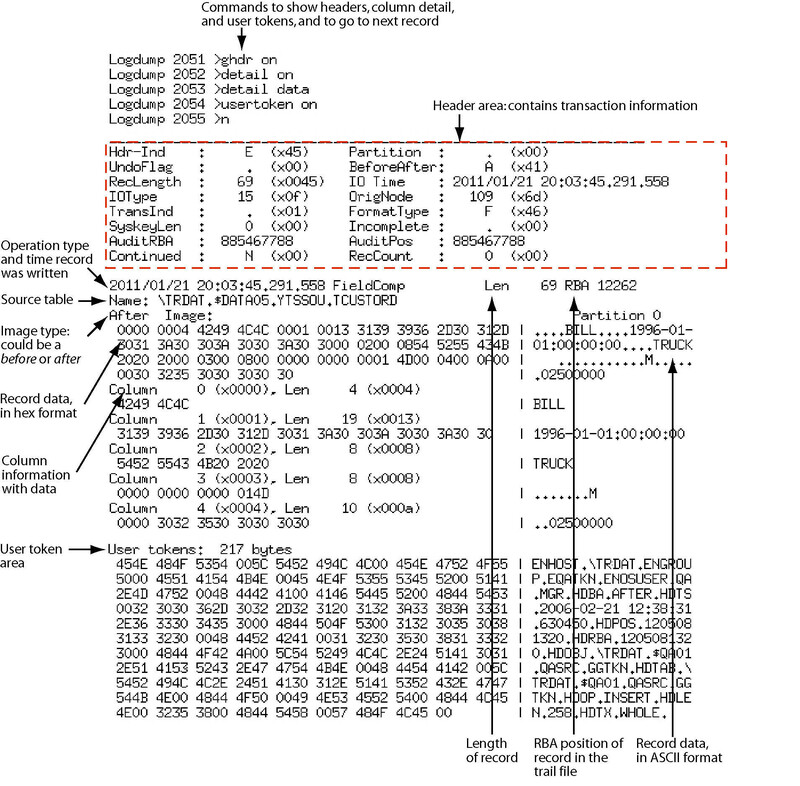 Alternatively, you can simply enter N.
Description of "Figure 1-1 Logdump Record as Seen on a Windows System"
Description of "Figure 1-2 Trail Record as Seen on NonStop"
The following are some basic tasks that can be performed with Logdump. For detailed information about the commands shown and other available options, see the alphabetical reference in Chapter 2, "Logdump Commands." Alternatively, you can simply enter SFH. Go to the next record. View the TransInd field in the record header. The following table explains where the record is in relation to the transaction. Move through subsequent records by pressing N, and refer to the TransInd field to determine where each one is within the transaction. When TransInd is either x02 or x03, the TransInd of the next record should be x00, starting a new transaction. Alternatively, you can simply enter SFET. The record shown will be the first one in the next transaction. To confirm, the TransInd field should be x00. This displays the record located at that RBA. Now, when you use the N command, you will only see records that satisfy this filter. Conversely, to filter out records containing a specific table or file name, but show everything else, use the EXCLUDE option instead of INCLUDE. Use MATCH ANY or MATCH ALL depending on whether you want the search to match any or all of the filter conditions, respectively, when multiple conditions are specified. The preceding example filters on a name and record type, typically an operation type such as INSERT. This shows which features are enabled, such as filtering and header views, and it shows environment information such as the current trail and position. Use Logdump's TRANSHIST command in conjunction with other Logdump commands to determine whether or not your applications generate large transactions and to identify their relative size. TRANSHIST causes Logdump to track the size of transactions contained in a trail file or extract file in an internal history table. The transactions are ranked in descending order of size, in bytes. When the history table is full, the smallest transaction is removed to allow a larger transaction to be added to the list. Use TRANSHIST to set the size of the history table that tracks transaction size. The maximum size is 200 bytes. A value of 0 turns off the tracking. Use either the TRANSRECLIMIT or TRANSBYTELIMIT command to set a lower boundary for what is considered a normal sized transaction. These commands prevent normal-sized transactions from being tracked. Eliminating normal-sized transactions reduces the amount of data that must be reviewed. Logdump scans the file(s) and reports the information. Use Logdump's POSITION RBA command to go to each RBA listed in the COUNT output to find out the name of the table that generated the transaction. You can group these tables into their own processing group so that they do not affect processing of other tables that generate normal sized transactions. On Windows and UNIX systems, command history is stored in a file named logdump.hst. On NonStop systems, command history is stored in a file named logduhst. The file is created in the home location of the user who first started Logdump. If the file exists, Logdump loads the command history into a buffer. The command history buffer holds 400 commands. Upon termination of the Logdump session, the session's history is appended to the file. To learn more about Logdump commands, see the alphabetical reference documentation in Chapter 2, "Logdump Commands".